July 10, 2013, Victoria, BC (ISN) – The Victoria Eagles and Victoria Mariners would split their final two Premier Baseball League meetings of the year, as the Eagles would take a dramatic 4-3, 12-inning win in Game 1 while the Mariners would respond with an 8-2 win in Game 2 at Henderson Park on Wednesday afternoon. The Game 1 affair was a continuation of a 3-3 game played last Thursday at Lambrick Park that had to be suspended after 10 innings due to curfew. The game resumed Wednesday in the top of the 11th with Eagles pitcher Adam Bontkes and Mariners pitcher Nick Dawson on the mound. In the top of the 11th, the Mariners would threaten immediately as Bontkes issued a lead-off walk, a sacrifice bunt and another walk to put Mariner runners on first and second. That prompted a quick Eagles pitching change and Tony Ebbs-Canavan came in and induced an inning-ending double play to get out of the early jam and keep things tied 3-3. Things would stay that way until the bottom of the 12th and with two quick outs and the game seemingly heading to a 13th inning, Dawson would surrender a two-out walk to the Eagles Vinny Martin. 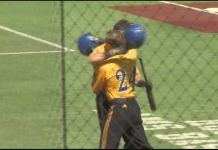 That would prove deadly, as the next batter was league leading hitter Brandon Feldman who promptly lined the first pitch he saw into the gap in right centre for a double that scored Martin from first and gave the Eagles the dramatic walk-off win. In Game 2, the Eagles sent righty Riley Edmonds to the mound, while the Mariners countered with Chris Fougner. Edmonds, who baffled Mariner batters in that 3-3 stand-off last Thursday, began the game well with a strikeout, but that’s when the magic ended, as a Chris Fougner double would begin a parade of five hits, including singles from Morgan Varley, Brendan Somers, Matt Wellington and a bases-loaded double from Evan Willow that would score three and vault the Mariners into a quick 5-0 lead. The Mariners would add 2 more runs in the 4th inning, as Willow and Piechnik would reach on error and then be cashed in on a 2-RBI double from Fougner. 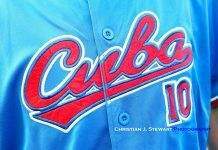 They would add another in the 5th on a RBI-single from Willow to make the score 8-0. Fougner would complete five innings on the mound and then give way to Jacob Barnard who kept the Eagles off the board in the 6th, but would then struggle in the 7th, giving up three singles including a 2-RBI single from Martin to give the Eagles their first and only runs of the game. After that, Dan Phillips came in to clean up the final out in relief. 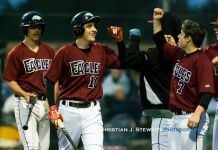 For the Eagles, the loss was charged to Edmonds who went 5 innings, giving up 5 runs on 6 hits with 1 walk and two strikeouts. Also seeing action on the mound for the Eagles were Junior call-up Lyndon Simmons, Jason Heckl and Brett Hull. With his double in Game 1 and a 3 for 4 performance in Game 2, the Eagles Brandon Feldman raised his league leading average to .434, well ahead of his nearest competitor. With the split, the Eagles move to 25-18 on the season while the second-place Mariners move to 30-16.